Catch Your Inner Genius By The Tail and Make Your Dreams Come True! This creative one-to-one coaching approach was pioneered by Lucia Capacchione PhD (www.luciac.com) who worked in Walt Disney Studios. She saw that all the films being made had many stages of creation, including collage, model making and design techniques that tapped the creative genius of many people. She went on to design the life of her dreams, house and partner, and now trains Vision© Coaches from different parts of the world. 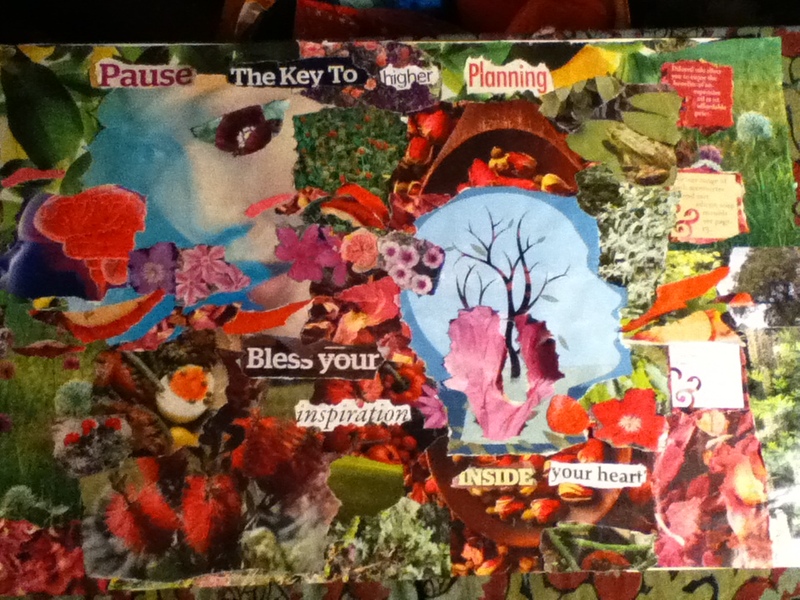 You focus on your heart’s desire and begin representing it in a photo-montage of thoughts and feelings in the first session. Out of this comes headline text and phrases that guide your imagination. Thereafter you recieve coaching that supports you in manifesting the life of your dreams, through Creative Journal, dialogue and affirmation, so that you literally embody your envisioned image and the feelings connected to it. You begin to imaginatively enact the stages of bringing your dream to life through block busting the obstacles in your way, letter writing, storying and brainstorming homework that builds your intention and commitment to your vision. This is your once and for all opportunity to work in a way that is unique to you, with fun, optimism and imagination. 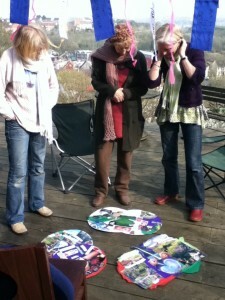 Coaching questions guide you all the way to review your experiences, insights and intuitive imaginings. It takes only 90 days to change a habit of mind, they say. Why not make these three months count for the rest of youir life! After an initial session of assessment and prepartion, a minimum of five – max 13 – further weekly or fortnightly sessions is required to complete your vision process. Coaching is done either face to face, through Skype, email or the phone. Full cost of the series is required before the initial session. 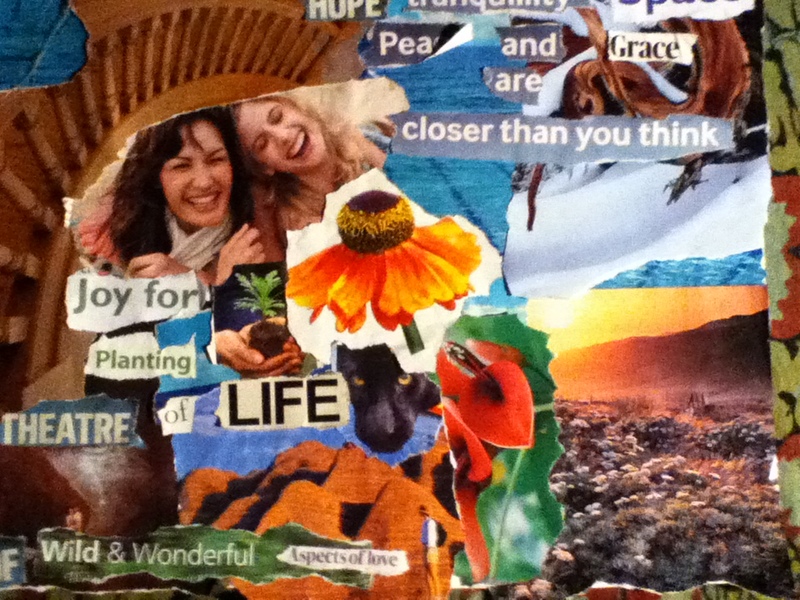 This collage of two faces respresents the work I do with brain balancing. The right hemisphere on the left of the picture, symbolises the intuitive and imaginative thinking and feeling, and the one on the left hemisphere is symbolised on the right, dealing with precision perception, speech and organisation. Between then lies a bridge of organic growth as the two learn to communicate to put visioning into daily practice. 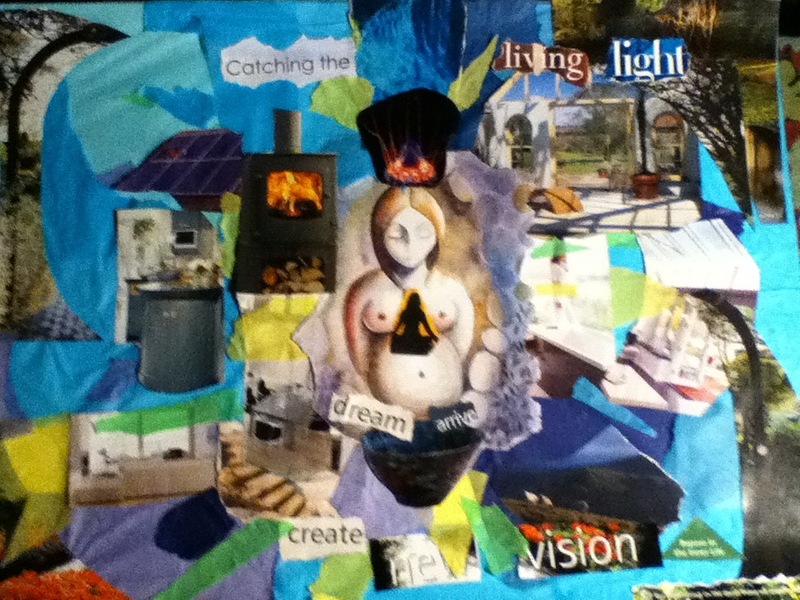 ‘Light House’ 2011 – This collage represents the house I would like to live in, with sunlight, solar panels, wood fire and a natural setting. This is my vision for my work, a place where small groups can come to form a creative santuary and work on their heart’s desire or dream. 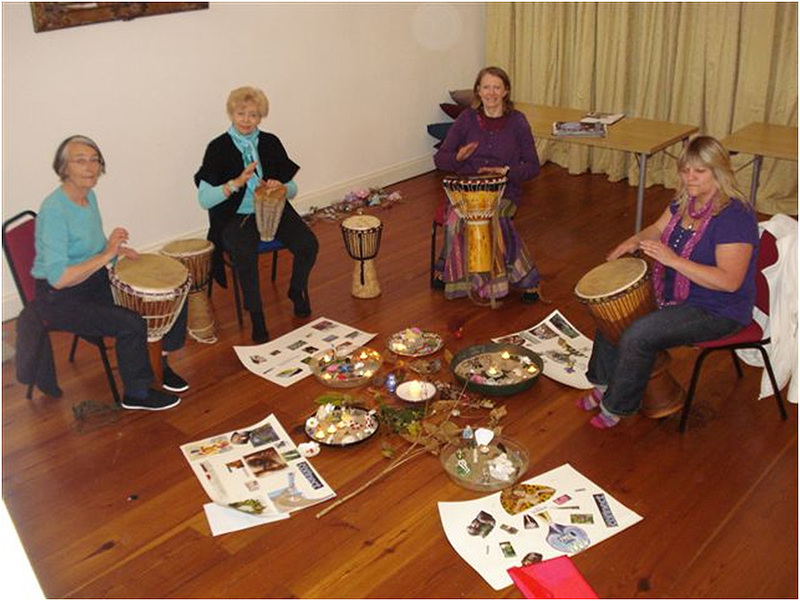 and are drumming to empower their vision with commitment and clarity. The Phoenix Centre, Dunwich, 2009. 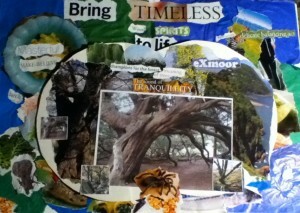 The finished collages: they involved two overlapping circles, the left represents present time, the right a vision goal for the future, and the overlapping centre the support and nurture needed to achieve the aim.